Austin, TX—July 30, 2014—Falcon Containers, a leading provider of modified shipping containers for workforce housing, portable office space, and commercial/industrial storage, today announced the addition of Mason Duncan, Vice President of Sales. As a former VP at Pilot Logistics Services, Duncan will lend his energy sector knowledge and customer service expertise—particularly in delivering convenience and cost-efficiency to oil and gas man camp projects. Duncan joins Falcon after spending the past seven years in drilling and exploration support services. He has an extensive background in energy equipment and transportation logistics, as well as proven client relationship skills. 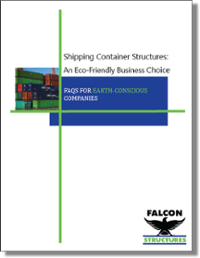 Founded in 2003, Falcon Containers repurposes shipping containers to create living, working, and storage solutions for a wide variety of industries. Backed by an experienced team of designers and engineers, Falcon can modify Conex boxes to serve as temporary housing units, portable offices, and other highly-secure onsite structures. Falcon’s growing client base includes major energy corporations, defense contractors, construction firms, and the US Department of Defense.